Ease of installation i.e. can I do it myself? If you have started looking at all the different kinds of insulation available, you will probably have come across references to R values, K values & U values. What do these terms mean and why are they important? R values and K values are closely related in that they are different representation of the inherent insulating ability of the material. Put another way, they describe how good a conductor of heat the material is. Obviously for insulation you want a poor conductor so that heat is retained in the building. The K value or thermal conductivity is usually measured in Watts per metre per degree celcius (Kelvin to be 100% correct) abbreviated as W/m.k ;The lower this number, the better the insulator. R values are used more in the United States than in the UK and is simply 1 divided by the k value and measures the resistance to the transfer of heat through the material. The higher the R value the better the insulator. This brings us to the bit that the Building Regulations always talk about, the U value. The U value is actually a measure of the overall ability of a wall/roof/floor to prevent heat loss, and is measured in watts per square metre per degree celcius (kelvin) and is abbreviated as W/m2.k The U value takes into account all the k values of the various parts of the roof/wall structure, as well as the factors which determine the transfer of heat from inside the room to the roof, and from the roof to the outside air. As you can see from the chart, some materials like Rockwool, need to be twice as thick as foams like phenolic, polyisocyanurate & spray foam (polyurethane). Installation of the insulating material is an important consideration, as not everyone has the skills to accurately cut large pieces of insulation. 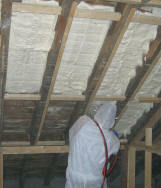 With the exception of spray foam insulation, all loft insulating materials need to be fixed into place with supports, or cut so accurately that they are a tight fit (and hold themselves in place). 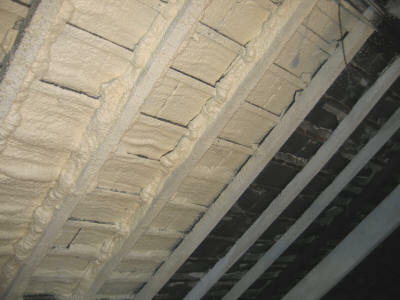 Rolls of insulation e.g. 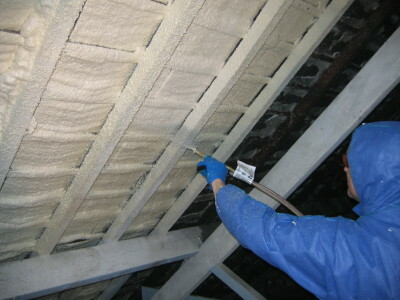 Fibreglass & Rockwool rolls are not designed for pitched roof of wall insulation, but rather for placing on top of ceilings to insulate the room below. Rolls are often confused with Rockwool batts and boards, which are designed for these applications.